Hallelujah November is here! Never have I ever looked so forward to a November as I do this year. My husband is running for local office and I will be so happy after election day because things can return to normal at my house. I usually don’t get this personal here but I wanted to give you a little glimpse into life lately and my lack of posts. We haven’t had a family dinner together in so long, I am averaging 4-5 hours of sleep a night due to stress dreams, and I have had an eye twitch going on three weeks. My husband has been out knocking doors and talking to voters on almost a nightly basis since this summer. He comes home after the kiddos are in bed, reheats dinner, and we sit down together to write thank you notes to the voters he talked to that night. After the election I am looking forward to sitting around the table together as an entire family again and not have the stress of an election looming over us. This year I am breaking down my resolutions into (hopefully) attainable monthly goals. The first week of each month I am going to update you on how I did the previous month and what I hope to accomplish during the current month. My October Goals have been updated with what I was able to accomplish. Spoiler Alert: I didn’t accomplish a damn thing. With November being the month we celebrate Thanksgiving I am going to focus on gratitude this month. This will be so good for my soul especially after the craziness of the last few months. I want to take a deep breath and live slower this month. I am pledging to skip the fast food this month …that happened way too many times in the last few months, it is actually very embarrassing. Last month I thought I was going to do a Whole30 but dude that ish is so hard to stick to when you are stressing out. Will I be doing a Whole30 this month? Probably not but I am publicly stating that I have eaten my last piece of Halloween candy! This month sugar will be taking a hike. Adios sugar! I have been using these posts to reflect on the goals of the previous month and set new goals for the current month. In that process I have also looked back through my Instagram account to see what I shared last month. It is a nice reminder of what was going on. Like I said earlier I thought I was going to do a Whole30 so there are several posts of my compliant meals. Read 3 books (I am on Goodreads follow me!) YES! Only miss 1 workout (I missed today’s because I didn’t sleep last night) YES! Even went on Thanksgiving Day! Last month I did manage to squeeze in two books: The Drawing of the Three and The Waste Lands by Stephen King. They are book three and four of the Dark Tower series. I am hooked! I just noticed that I am one book away from reaching my goal of 24 books this year. Woo! If you’re in Omaha and you are looking for a great gym full of supportive women give me a shout. I absolutely love the community at my gym and would love to have you join us. Let me know your goals in the comments or shout it out to me on social media. 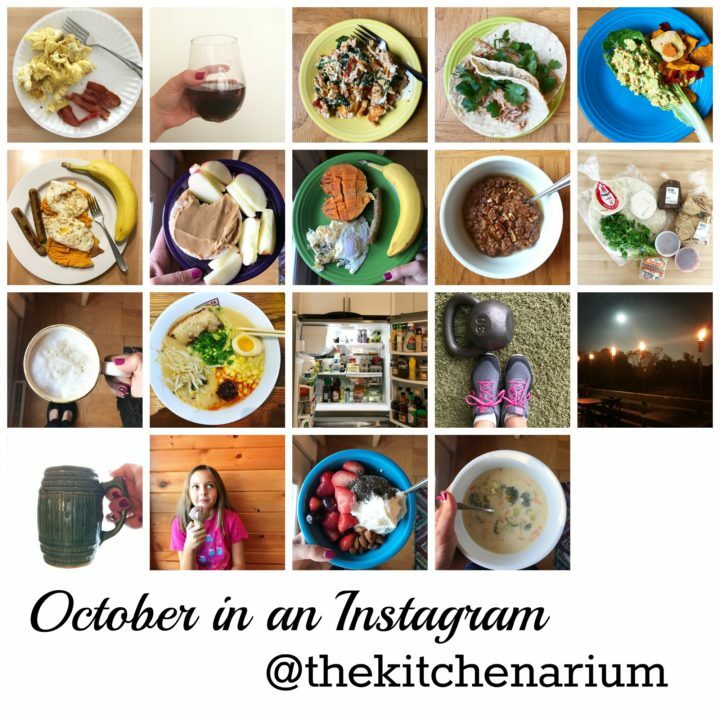 Sign up for my email newsletter to stay up to date on all things The Kitchenarium.